Kevin Bonnie from International Yacht Collection sends word of a €200,000 price reduction for the 28.3m motor yacht, Bear Market. Built by Overmarine in 2003, Bear Market is a high performance sports yacht with twin aqua jet engines producing a cruising speed of 31 knots. She accommodates eight guests comfortably in a master and three VIP cabins. Well maintained with low running hours, Bear Market was previously listed for sale at €2,700,000. 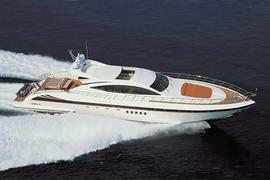 Now priced at €2,500,000, she is currently moored in Cannes.